Biloxi, Mississippi – The development partnership of NLD Biloxi, LLC recently sold Shoppes at Beauvoir, a 6,300 square foot strip center, for $1.85 million. 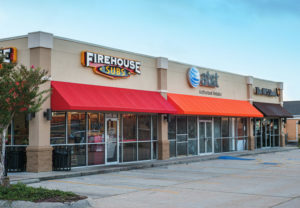 A former Blockbuster Video location on the corner of Beauvoir and Pass Roads, the building was redeveloped in 2013 and is now home to Firehouse Subs, an AT&T Authorized retailer, and The UPS Store. The buyer, an undisclosed Louisiana investment company, was represented by Christopher K. Dozier of Retail Specialists, Inc. The sellers were represented by co-owner and developer, Doug Molyneaux, CCIM, of Catalyst Retail Developers.